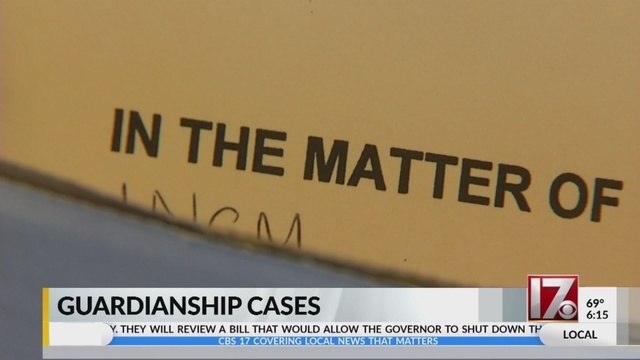 North Carolinians describe guardianship as a ‘sick, twisted process and you’re just basically stripped of your civil rights.” Guardianship is a court process where anyone can claim you’re incompetent and petition to be your guardian. | F.A.C.E.U.S. That’s how Perquita Burgess described guardianship in North Carolina. She came to CBS 17’s Beairshelle Edmé concerned that her 79-year-old mother fell victim to fraud and abuse after being ordered into guardianship, following an ongoing family dispute among sisters. Guardianship is a court process where anyone can claim you’re incompetent and petition to be your guardian. It’s typically used for elders or those who are physically, mentally, or cognitively disabled. Within a matter of weeks, the court holds a hearing after a court appointed attorney, also known as a guardian ad litem, investigates the petition. A clerk takes the evidence, which doesn’t require a physician’s medical evaluation, and makes a decision based heavily on the guardian ad litem’s recommendation. Cathleen Skinner and her husband, Mark, fought for more than a decade to regain her independence after being ordered into guardianship. “This is what happens when the court system is just messed up, total, from the bottom to the Supreme Court,” the woman’s husband explained. Cathleen Skinner tells CBS 17 she suffers from short term memory loss. A family member filed for guardianship, one who she claims wanted to ice her out of her dying mother’s wealthy estate. “It’s a nightmare (be)cause I just want to be with my husband and have a life,” she lamented. Instead of family, a clerk appointed Wake County Human Services as a temporary guardian. They placed Cathleen Skinner at The Oliver House. She clarifies that her confusion was about why she’d been forced in guardianship, a process she feels did not take her wishes into consideration. Mark Skinner, who was only her boyfriend at the time, filed an emergency motion. He said after years in court, and at least $70,000 in legal fees, he finally became Cathleen’s guardian, which she says is preferred if she must have a guardian. The Skinners story doesn’t surprise Ginny Johnson. Her 95-year-old dad died a year after being ordered into guardianship. According to the veteran’s doctor of nearly 40 years, the World War II POW was in superb health with great agility, and noted that moving a person of his age from his home can lead to a decline in health. Mr. Johnson’s case landed in a Wake County court after a dispute between Ginny and her sister. In the end, a clerk ordered Aging Family Services as a guardian, which placed him at the Blue Ridge Health Care Center. His guardian sold his million dollar home to pay for the center and other expenses. A federal investigation later shut that facility down for “substandard quality of care,” just three weeks after Mr. Johnson’s death. CBS 17 set out to get more insight from the legal community and elder abuse advocates. Attorney Reginald Altson says he’s now advising several people in Wake County who also say they’re victims. He’s spent several months defending at least one client in Forsyth County, where he claims people have similar concerns and allegations. Richard Black, with the Center for Elder Abuse Reform, has investigated guardianship issues across the nation and he’s now focused on North Carolina. “What I am saying is North Carolina has a process that is in grave need of improvement and the people who should be sponsoring and driving and endorsing those improvements are doing everything to keep it what it is,” Black, of Charlotte, detailed. The CBS 17 Investigators spent days combing through nearly 250 files from 2017 and found more concerns. In another, a niece cites concerns about a state-contracted company that served as guardian. In a separate case, a guardian ad litem recommends a public, “limited guardian,” noting that more input was needed during the hearing about what rights should be retained. The records show that same day a clerk appointed a state-contracted company as a full guardian, the ward retaining no rights. The case file does not provide any notes of further testimony or input given during a hearing. Knox describes guardianship as a “big deal.” She tells CBS 17 that her office has done everything to protect people. “We simply follow the law that the legislature puts out so if they want things changed then they need to go to legislature and ask for the laws to be changed,” Knox said. She adds that her office investigates all complaints, a reason she said Mark Skinner was able to become his wife’s guardian. Knox believes there are safeguards in place, like state standards for facilities and annual accounting reports for guardians. Some North Carolina advocates and families aren’t convinced. “We’re stuck for life like this. All we want to do is be left alone.” Mr. Skinner said. His wife agreed. “I want our rights given back so we can have our own life,” she said. In Washington, lawmakers have taken action. In October, the president signed into law “The Elder Abuse Prevention And Prosecution Act.” Another senate bill focused on guardianship accountability and oversight also remains with Congress. As for protecting yourself, experts say have a power of attorney, health directive, or estate plan in place. « The 20th Judicial District (Boulder) Judicial Performance Commission held a public hearing May 15, 2018 to receive comments about judges. They’re not required to hold a hearing. And after recent statutory revisions, public hearings aren’t recommended anymore. The judges up for retention this year are: District Court Judges Thomas Mulvahill and Norma Sierra, and County Court Judges David Archuleta and Elizabeth Brodsky.